Been diving in Cueva Taina? Please Vote! Descending the staircase into Cueva Taina‘s outstanding surrounding really gets the blood pumping, entering into the beautiful turquoise water of the sinkhole, this cave has it all. 2 main passages; Left Tunnel and Deep Tunnel, revealing unique and diverse topography, formations and a variety of bottom type’s solid rock, gravel, silt and more. The entrances decorated with century old stalactites and stalagmites formations. Left Tunnel 20m max depth send us on a journey through a halocline, massive rooms highly decorating but filled with none breathable gases so keep your reg’s in, into sections with almost luminescent white walls that glow with the light from our torches. Deep tunnel takes us through a section of tight passageways and into areas of enormous proportions, this area is for technical cavers and to depths greater than 35m, reaching the end of this line is a proud accomplishment for many of us, marked with a cookie left behind to permanently note the successful mission. We Cave Dive provided a professional, private and a tailored dive to my needs and experience; I will be seeing this cave again! Great shallow dive site for begginers and photographers with a lot of marine life and some historical artefacts. El faro is a beautiful reef near Saona Island. The St. George is an artificial wreck sunk in 1999 and located in Bayahibe. 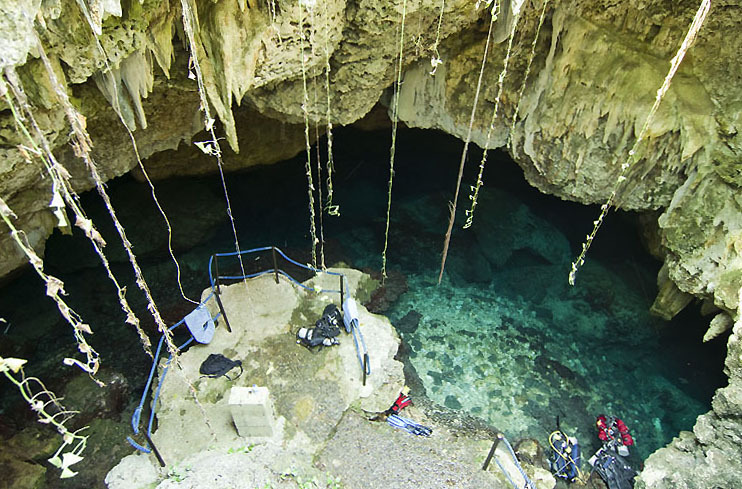 Cueva Taina is one of Dominican Republic's best cave diving with various tunnels and passageways. Map of Dominican Republic, Cueva Taina dive site.